Over the past few decades, John Eaves has had a major impact on the look of the Star Trek Universe and played a pivotal role in shaping Gene Roddenberry's vision. Starting with his work on Star Trek V: The Final Frontier, Eaves has worked as a production designer, illustrator and model maker across the franchise. He has been responsible for creating many of the props and ships, and helped develop the Federation design, from the U.S.S. Enterprise NCC-1701-E to the U.S.S. Discovery NCC-1031. Coming November 27 from Titan Books, Star Trek: The Art of John Eaves represents the most extensive collection of designs and illustrations created by Eaves across the Star Trek Universe. 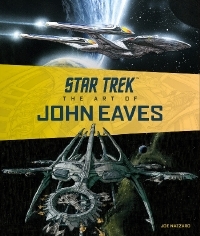 Featuring fascinating pencil sketches and stunning concept art, this visually dynamic book gives fans a unique in-depth look into Eaves' creative vision and the wealth of his remarkable work at the centre of this spectacular franchise. Quiet Earth is proud to offer Star Trek fans and art lovers alike the opportunity to win a copy of the hardcover art book! To enter, simply send an email to contest[@]quietearth.us and use the subject line Star Trek. You must be a resident of Canada, US or UK to enter. Good luck to all. The contest will run until November 27 for one week! Star Trek? John Eaves?! Yes, PLEASE!! !